Normally, I restrict myself to reviewing recently released books or books that were offered charitably to me for review. But because of my recent Anne Rice obsession, due to being inspirited by her fascinating conversion story, I have decided to review the first of the Vampire Chronicle books. This book has remained the epitome of vampire novels and in my opinion, nothing marginally compares to it. Anyone has been focusing on Anne Rice for the last two or three years with her recent conversion to Catholicism. In my own words, I love to term it the return to her sanctum. Nearly every Christian news outlet have been overflowing with discussion about her newly released religious novels or the honest, emotive testimony that has caused even me to reanalyze my own personal creed. Typically some Christians, from what I’ve encountered, see to it that any of Anne Rice’s publications never be read by any evangelist. More specifically, they denounce her works, hoping other Christians will follow suite. Because reading anything with creatures of darkness, in their opinion, could greatly besmirch one’s religious beliefs. Personally, I’ve seen the film and read the book in high school and never felt drawn to becoming a vampire or having a belief in their existence. 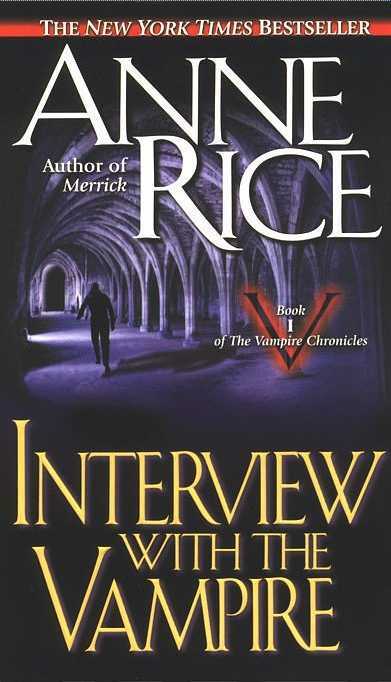 Similarly to Harry Potter and other fantasy stories, Anne Rice’s “Interview with the Vampire,” has an interior story about alienation and loss of spirit or faith in the solid world. The interior story of melancholia is the ignition for people’s love for these books. Anne Rice’s carefully crafted first person perspective provides us with an outlet to express the inexpressible feelings we develop in the real world. Out of fear of being accosted for our feelings of disillusionment, we mentally place ourselves in Louis’s head. From his perspective, we see ourselves mirrored back in stark detail. In typical Anne Rice fashion, we see the potential monster in ourselves that seeks to manifest itself. Additionally, we resonate with Louis’s futile attempts to understand the oftentimes meaningless elements of our mortal lives. Symbolically represented through insatiable blood lust, we covet other people’s happiness and seek to sap them of their happiness in order to abate ours. Even more apparent is the metaphor of blood lust as the representation for our base desires that wish to be sated. Because, doing so prevents us from thinking upon the truth of our existences our at least the truth of the darkness. According to Anne Rice’s “Called Out of Darkness,” she has mentioned that she had difficulty wit reading books all throughout her life. Her writing style is derived instead from the images that were implanted in her mind rather than a style crafted completely by the large number of different texts she read. Personally, I feel that this appreciation for the images in our world helps her own writing to be a sumptuous detailing of the physical and abstract elements of our world. Without this ardor of images, her writing would definitely not be as intoxicating as it is. Identically to many modernist poets, her images allows for her stories to be nonlinear and to allow for readers to shape their own meaning. If Anne Rice were a technical writing, I honestly believe her books would not nearly be as popular. Due to the ability for people to become enraptured by Anne’s descriptive prose, people remain loyal readers and continue to read all her works in order to piece together the tapestry of the human psyche that the books of the Vampire Chronicles vividly paint. Also, just as most of the images of the Catholic Church remains in her mind, a number of the images from her stories are unconsciously embedded into our minds as well. For example, though I am unable to recite certain quotes from her books, I can remember the desperate need Louis has for companionship because of the number of images in Anne’s books that subtly present this. For any Christians, such as myself, please bear in mind I am not proclaiming these books to be definite Christian novels. But I cannot say that they are not Christian in spirit. “Interview with the Vampire” portrays disillusionment with God far better than many other novels. For that reason, I truly believe the need for God that Anne Rice had helped her to write a number of novels that intelligently describe this need in some shape or form. To others, please read these books especially if you have read any of the Twilight books. Since these books exceed Twilight in all areas, especially in terms of substance. Anne Rice's Vampire Chronicles are much more rich, interesting and better written tan Twillight. I'm a huge Anne Rice Fan and I think Twillight is an insult to Vampire Novels. Anne Rice's romanticism is much more seductive to the mind.